A majority of Americans disapprove of Obamacare, the highest share since President Barack Obama's health care reforms became law more than four years ago, according to survey findings released Friday. The Henry J. Kaiser Family Foundation's health care tracking poll for July reveals that 53 percent of people view the Affordable Care Act unfavorably, a jump of 8 percentage points since June. 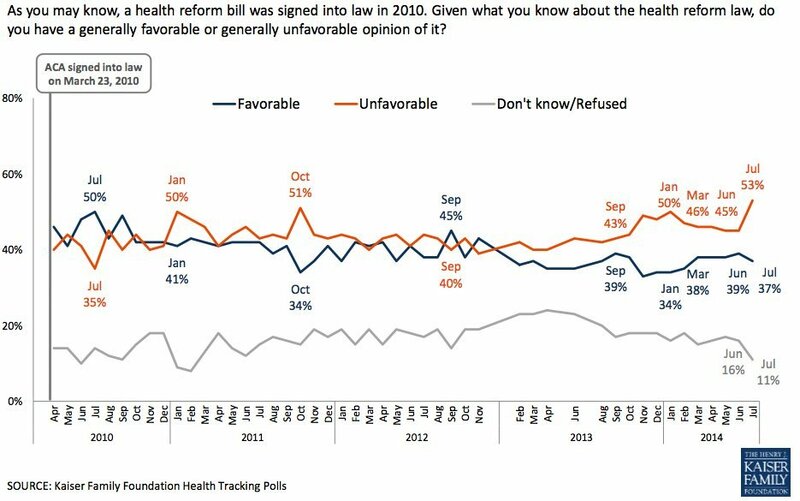 July's results mark the fifth time since April 2010, and the first time since January, that at least half of Americans are not supportive of the health care reform law. The poll found that the share of people who view Obamacare favorably fell slightly, to 37 percent, marking the lowest rating the law has received since its passage. 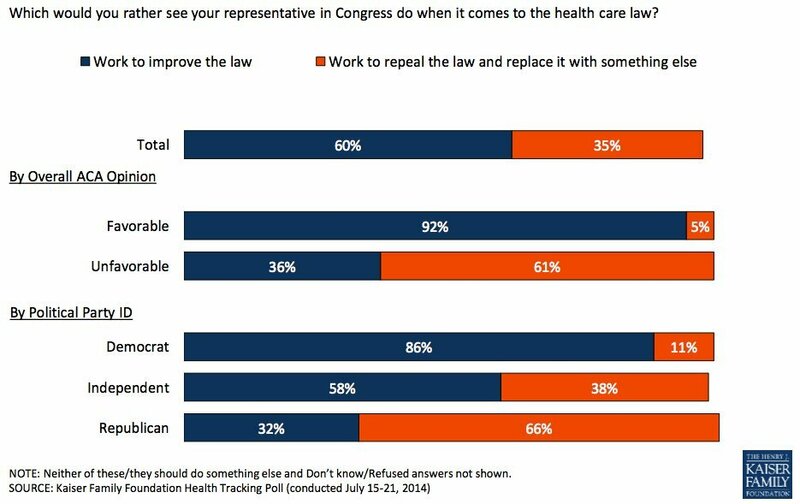 Views about the ACA remain sharply partisan. The rising opposition to the Affordable Care Act and the corresponding sinking approval come despite Obamacare's rebound from the disastrous, chaotic launch of HealthCare.gov and the first enrollment period that began last fall. By April, more than 8 million people had used the law's health insurance exchanges to sign up for private coverage, with 86 percent of enrollees receiving financial assistance. Millions more enrolled into Medicaid or the Children's Health Insurance Program, which offers insurance to children in families with incomes too high for Medicaid. The law also appears to be significantly reducing the ranks of the uninsured. According to the Department of Health and Human Services, the number of uninsured people in the nation has dropped by 10 million people because of Obamacare enrollment. But Obamacare has always had weak support among the American public. Previous Kaiser Family Foundation surveys show only three months since Congress passed the law in March 2010 when more people approved than disapproved. The list of reasons is lengthy. Republicans have been unrelenting in their attacks, such as the lawsuit planned by House Speaker John Boehner (R-Ohio) against Obama for delaying the law's employer mandate. The public has remained strongly opposed to key features of the law, especially its individual mandate that nearly everyone obtain health coverage, and memories linger of Obama's broken promise that people would be able to keep their current insurance policies. Polls also show that many Americans, including the uninsured, believe they can't afford the insurance sold on the Obamacare exchanges, and aren't aware that financial assistance is available. And alongside bits of good news for Obama, like the falling number of uninsured Americans, is more bad news, like a federal appeals court ruling last week that would devastate Obamacare, and a federal audit this week concluding the HealthCare.gov debacle still isn't fully resolved. The new Kaiser Family Foundation survey shows how Americans' perceptions of Obamacare are shaped. 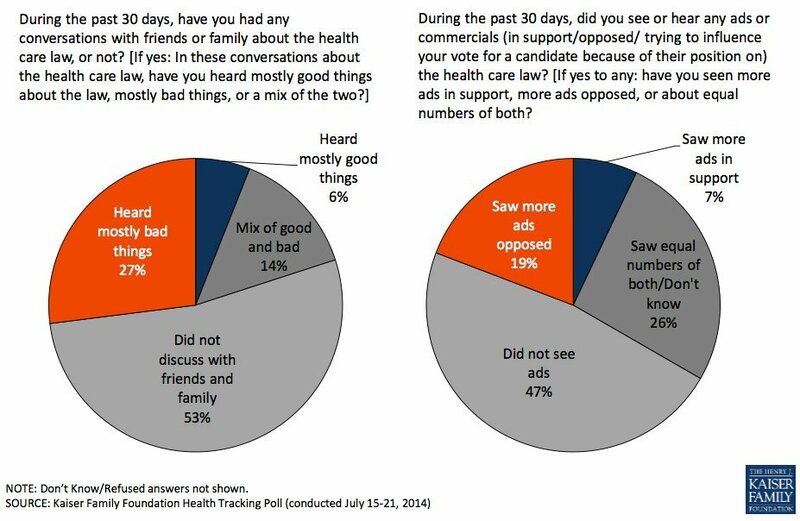 Less than half of those polled had discussed the Affordable Care Act with family or friends, and just over half had seen TV ads about it. However, what people did talk about or see was negative. More than half of respondents said they hadn't personally been affected by Obamacare. Of the people who said they had been affected, more were likely to say it had harmed them or their families than helped. Another Kaiser Family Foundation report, published last month, got markedly different results when polling only those who had enrolled into coverage through the Obamacare exchanges. More than half of the people who used a health insurance exchange, and 60 percent of those who received financial assistance, said they had benefitted from the law. Even as many people expressed negative opinions about the Affordable Care Act, the poll also found that 60 percent of Americans don't favor repealing it (the GOP's standard take when it comes to the law). Instead, people said they want Congress to improve the law. These views also fell along party lines. 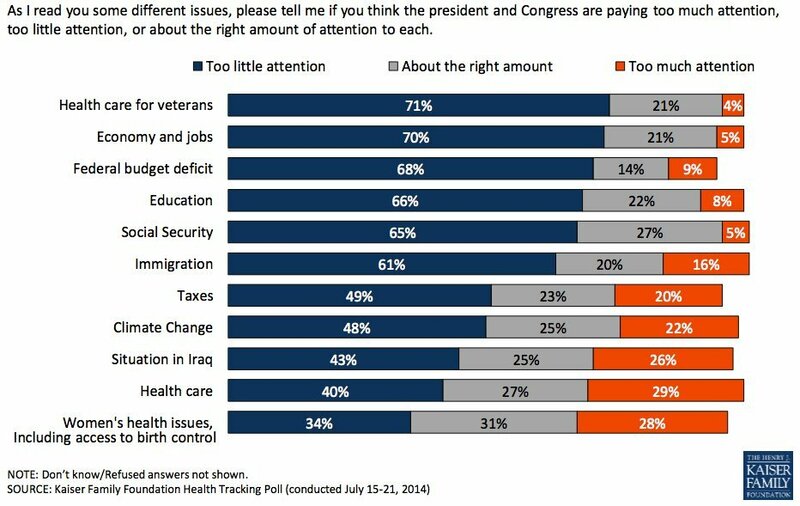 Moreover, Americans seem to want Obama and Congress to work on subjects other than health care reform, the survey shows.